The UK magazine ‘Elvis: The Man and His Music’ has been published since 1988 and recently celebrated its 100th issue. Published quarterly by ‘Now Dig This’ (a separate monthly magazine focussing on Rock’n’Roll & established back in 1983) ‘Elvis: The Man and His Music’ is put together by editor TREVOR CAJIAO. 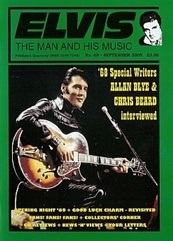 The magazine features articles by Trevor Cajiao plus main contributors Gordon Minto, Paul Richardson, Luther Moore and Keith Flynn along with plenty of other Elvis luminaries such as Ger Rijff & Arjan Deelen. As Elvis’ music is my main interest I have also contributed a few articles myself. If you are interested in Elvis’ music over impersonators and jumpsuits then EIN thoroughly recommends this great magazine. Below we try and keep you up to date with recent ETM&HM issues. 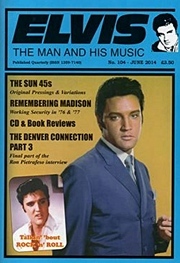 ELVIS - THE MAN & HIS MUSIC is a quarterly publication dedicated to Elvis Presley: The King. 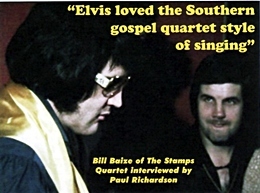 It features exclusive in-depth interviews with Elvis Presley's associates (musicians, friends, songwriters and co-stars such as Scotty Moore, Otis Blackwell, Steve Binder, Bob Moore, Red West, Sue Ane Langdon, Clyde Otis, Duke Bardwell and Jerry Schilling), no-nonsense CD, DVD and book reviews, detailed articles on all aspects of Elvis' career, previously unpublished and rare photographs, plus all sorts of other good stuff. Editor Trevor Cajiao notes - From the very first issue of 'Elvis - The Man And His Music' almost 25 years ago, it's pretty obvious that we were on a mission to bring some kind of relevance back into the Elvis world. Our aim was to produce a magazine that concentrated on documenting and celebrating his musical legacy. This was at a time when all the 'Is Elvis Still Alive?' rumours were rife, impersonators were springing up at an alarming rate and, as far as the general media were concerned, Elvis was little more than a joke. A lot has happened in the Elvis world in the intervening years to change that. Yes, there's still the tacky side of things which, unfortunately, will always exist (even EPE are now promoting impersonators - God help us!). But ignoring all of the irrelevant garbage, we've all been able to learn so much more about the man and his music thanks to a steady stream of quality projects (both audio and visual) put together by people who care. Cream always rises to the top, and for an entertainer who has been dead for more than 35 years, we've had more than a generous helping of cream via 'new' discoveries to keep us entertained. The unearthing of such treasures has returned the focus to Elvis' music and thankfully won him back some of the respect so blatantly missing beforehand. I'd like to think that 'Elvis - The Man And His Music' has helped in some small way to redress the balance. We've never been on a crusade to restore Elvis to the charts, to get him back into public awareness or anything like that. Elvis is everywhere as it is! Hardly a day goes by without some form of reference to him in the press or on radio / TV (be it derogatory or otherwise!). His legacy is out there to be enjoyed by anyone who wants to enjoy it. Our aim has always been to talk about that legacy and report upon it in a factual, truthful manner. No sugar-coated crap like other magazines and organisations do; just the facts and the plain truth. Everything else is irrelevant. 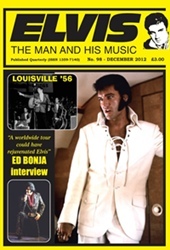 'Elvis The Man & His Music' #105 Out Now: The new issue of EIN's favourite Elvis magazine is out now. - Jim Colyer - Mystery Solved! - The Rarest, Most Unique Piece Of Presleyana? ETMM: How was it like playing before 60,000 fans in Pontiac, on December 31st 1975, ? of the people in the crowd could actually see what was going on. 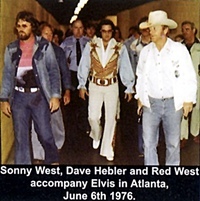 Knowing this, Red, Sonny and Joe gathered round him and they all held up long coats around Elvis while he changed. Elvis climbed back up the three flights of stairs and continued the show. Any way, it was a great and memorable night. ETMM:How was the Jungle Room set-up for the sessions? Bill Baize: From what I can remember, Elvis was in the area just as you step into the Jungle Room, which put him pretty much in the centre of the action. The Stamps were just to his left, a little in front of him. The band was kind of spread out around that area. I don't recall exactly who was located where in the band. I do remember at one point that Elvis and J.D. were sitting side-byside on the steps that enter the Jungle Room. This happened just before we were getting ready to leave one night. Elvis was having someone hit low notes on the piano and getting J.D. to sing along with them. He finally got all the way down to the end of the piano notes and then J.D. sang a note lower than that. We were all very impressed. Elvis was having the time of his life listening to J.D. sing lower and lower. It was like one good friend doing something to impress the other. Go HERE to ETM&HM to subscribe or just purchase this issue. 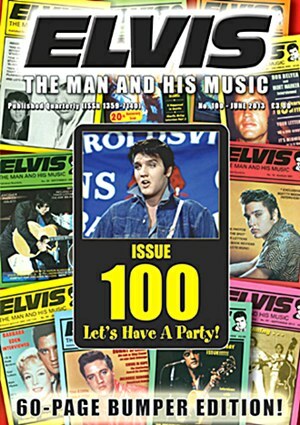 'Elvis The Man & His Music' #104 Out Now: The new issue of EIN's favourite Elvis magazine is out now. - Talkin’ ‘bout Rock n Roll - The Hillbilly Cat Speaks! and lots of other good stuff! - Click here to purchase this great magazine directly from EMM. 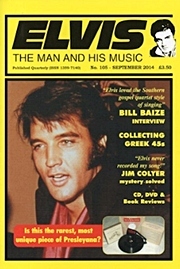 'Elvis; The Man & His Music' #103: The new issue of EIN's favourite Elvis magazine is out now. when he said that, I mean, these two women went berserk and the whole place knew who it was and... So, all the preparation that we had done to keep this thing under wraps was pretty much gone by then." - What about the vile accusation that Elvis was racist? "Here's what I say: the proof is in what you do and not what somebody says about you. First of all, you're right; the staff there were Black Americans, and if you find them and talk to 'em today they'll tell you that they loved Elvis. They were crying so hard at the funeral and, when I was there during the mourning period, these women were crying constantly. They missed him and they were so sad. He had the black backup singers, The Sweet Inspirations, who he just couldn't say enough nice things about. The black lady on the street in Memphis that he bought a Cadillac for - this was something that I'd heard - he could have picked anybody but he picked her. If he was racist and he was anything like that, he wouldn't have even stopped. There was no press around. There was no newspaper there. There was no TV camera there. He did it because it was from his heart. 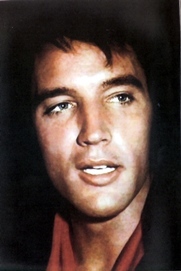 Elvis was not just a great entertainer; he was a good person." "Several months after my first visit, I was invited by a cousin of Elvis' to visit Graceland during a weekend pool party Elvis was hosting. It was Elvis, with his guys and a number of very pretty Memphis girls, having fun by the pool. What impressed me the most that day was a jukebox playing by the pool. I'd seen swimming pools before, but never saw anyone have a real live jukebox playing music by the pool. That it was Elvis' pool, and that he was standing there, in person, making his own selections on the jukebox, was kind of the icing on the cake. Piper, leading us all around the park to ride on the rides, from Ferris wheel, to merry-go-round to refreshment stands. I recall being part of the group who rode the bumper cars with him, and I still remember Elvis wearing a big grin as he chased my car around with his bumper car, happily crashing into me - and then zooming off to zero in on his next target." - So what were your thoughts on the Elvis movies of the '60s? "Elvis' early work showed more promise than his later formula musicals. I think he would have risen to the challenge had he been given more serious roles. From my observation, Colonel Tom Parker stood in the way of Elvis graduating from those lightweight musicals to roles that would have stretched him as an actor... I was backstage after Elvis' show in Las Vegas the night Barbra Streisand and her manager arrived to offer Elvis the starring role opposite her in 'A Star Is Born'." Click here to purchase this great magazine directly from EMM. 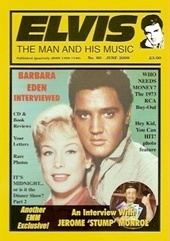 'Elvis The Man And His Music #102': EIN's favourite Elvis music magazine 'Elvis The Man And His Music No. 102' will be out soon. 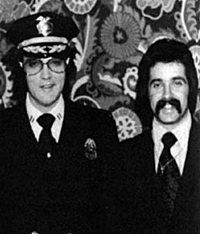 First in-depth interview (it'll run for three parts) with the former Denver narcotics police officer in which he talks about his friendship with Elvis. Includes stories of taking The King out on patrol (!!! ), hunting down jewellery for him and so much more! This is the first time Ron Steele has been interviewed. 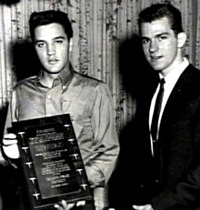 He was the engineer of Elvis' January 12th 1964 Nashville session ('It Hurts Me', 'Ask Me' and 'Memphis Tennessee') and although Chet Atkins has always been listed as the producer for this date (and Marty Lacker once claimed Atkins fell asleep at the session), Ron reveals he wasn't even there! - Two's Company? - The fake Elvis 'duets' fiasco. – Reviews - CD, DVD and book reviews. - Stolen! - We name and shame Peter Verbruggen of Elvis Matters who used our Stump Monroe interview without permission and then, when confronted about it, tried to lie his way out of it despite the proof being in his magazine for all the world to see! 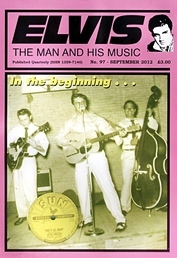 'Elvis The Man And His Music' Issue #101: Out Now the new magazine from ETM&HM. - Suppose... More Than Just Speculation? EIN has been overseas celebrating its own 100th anniversary recently so we've been running late with reviews. However the 100th issue of 'ETM&HM' is well worth your attention. 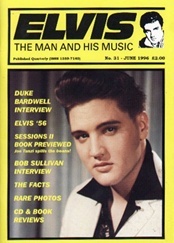 The magazine first appeared in 1988 and was the first to really focus on The King's musical legacy. Over 25 years the magazine has presented exclusive interviews, unpublished photos and fact-filled articles. The 100th issue is a 60-page bumper edition. What EIN enjoys is a magazine that delivers fascinating reading, new revelations, great reviews as well as some humour, and this issue has it in spades. Luther Moore examines all the excitements that have come to light in the last 25 years both official releases and bootleg. In it he notes..
of almost unimaginable discoveries... For those of us who'd believed that RCA had junked or erased all of their '50s session tapes, the past quarter century has brought some very pleasant surprises indeed. Inspired detective work and a thorough scouring of the vaults (both officially and 'otherwise') has seen outtake after outtake, rarity after rarity, finally brought to light. But rarity, of course, will often triumph over quality, as it did spectacularly with 'My Happiness' (1990's 'The Great Performances'). My God! Who ever would have believed it? Incredibly the second acetate surfaced too, even though - RCA being RCA - it took almost a decade for all four sides to see a collective release (1999's 'Sunrise'). So it wasn't just the bootleggers offering up the surprises. There have been some pretty nifty official releases too... How about a pre-master Take 5 of 'Heartbreak Hotel' no less ('Elvis 56'), Sun outtakes of both 'Blue Moon' and 'Harbor Lights' ('Today. Tomorrow & Forever'), and radio station acetates of the previously unknown 'Fool, Fool, Fool', 'Hearts Of Stone' and, more recently, 'Little Mama'. 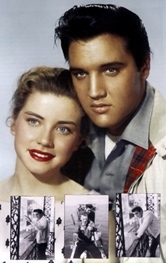 Of course, any '50s overview simply can't ignore Jorgensen's momentous 'A Boy From Tupelo', and by extension the FTD label itself. Elvis' '60s catalogue has been pretty extensively mined too with an array of simply stunning releases that would have been dismissed as sheer fantasy back in '88. Standouts include Bilko's jaw-dropping 'American Crown Jewels', 'Finding The Way Home' (Southern Style), and 2006's incredible five-volume 'American Way' anthology (Southern Comfort)...."
Donna Lewis, recorded in her diary -blasting out his bedroom window with a shotgun in a short, sharp, violent outburst. Indeed, so strong and frightening was Elvis' anger, and such was the concern for his health and well-being, that a sedative had to be administered. For the next two weeks, Elvis spent much of his time alone in his room, most likely stewing on all his problems, which now included this lawsuit, and regretting being so naive as to involve himself with people who were, he had told Red West, "cold-hearted businessmen"." - The Dirty Dozen - 12 of the worst Elvis cover versions. happened here, musically, during the 1960s? A whole rash of white middle-class art students suddenly thought they could pass for black Mississippi bluesmen with monstrosities like this as the result. 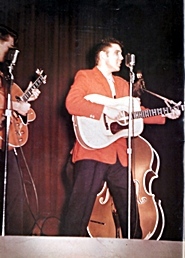 What made Elvis' waxing such a milestone recording was his instinctive command of the blues medium, born of his surroundings and moulded by his southern upbringing. Two hapless halfwits from suburbia were always going to be clueless, and so it proved." CONGRATULATIONS from EIN to all the gang at 'ETM&HM'. 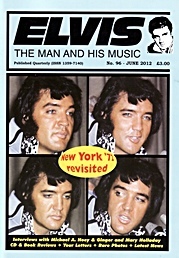 'Elvis The Man and His Music' Issue 99: The new issue of EIN's favourite Elvis magazine is out now. - It Takes One To Know (Take) One - Take 2! - From The Time: 1961 - Is Elvis No Longer The King Of Rock? - Readers' letters, News, rare pix - the works! - Heaps of CD reviews! Elvis The Man & His Music Christmas Issue: Our favourite magazine 'Elvis The Man & His Music' # 98 is out this week and heading to subscribers. For more info and to subscribe click here. 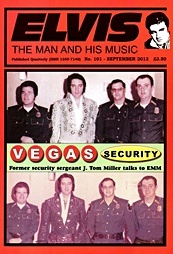 ‘Elvis The Man & His Music’ September 2012: Issue #97 of this fabulous magazine is out now. 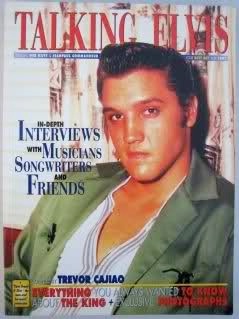 The BEST Elvis magazine around if you want to know about our man and his music. - Go here for more info. 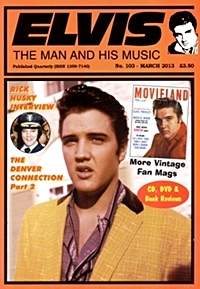 ‘Elvis The Man & His Music’ June 2012: Issue #96 of this very fine magazine is out now. - Book Reviews: 'Way Down - Jerry Scheff and detailed review of 'Jaihouse Rock: Frame By Frame'. Arjan Deelen talks to Mary & Ginger Hollaway over a fascinating 6-page interview. 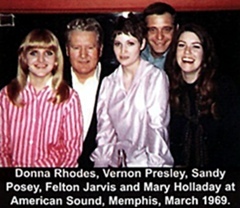 In it Ginger Holladay (shown right below with Elvis) has a lovely story about recording the unreleased 'First Time I Ever Saw Your Face' duet. he is, got very romantic about his part, and I being the shy 19-year old I was at the time, I was really excited about singing the harmony with him. But with Elvis you never rehearsed really. You just started doing it. And then hopefully one of the takes would be good. So we just started doing it. I was trying to make up my part, and Elvis was getting more and more emotionally involved in the song. Let's put it that way. So several times he would kind of put his arms around me and draw me in, and I would duck under his arm and step off of the wooden box, and then get back up there in time to sing my lines. It was a little bit like a comedy, I think. But we did it, and it was OK."
- The BEST Elvis magazine around if you want to know about our man and his music. DON'T MISS OUT on this great issue - Go here for more info. FTD Good News, Bad News - How many years to go? 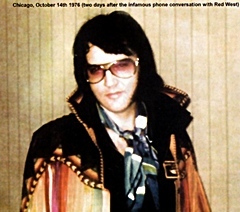 : In the EXCELLENT new issue of 'Elvis The Man & His Music' (see article below) editor Trevor Cajiao catches up for a long and interesting interview with Ernst Jorgensen. In it Ernst answers questions about the new FTD releases 'Promised Land' and 'Wonderful World Of Christmas' (why the true undubbed 'Merry Christmas Baby' was not included), the odd idea behind the splicing of 'Stage Rehearsal', Legacy releases, FTD books (the fiasco of 'Fashion For A King' "I think the book is important but the mistakes are very annoying") as well as a long discussion on Public Domain releases and the MRS label. Ernst - "There is a steady decline on sales of all product, but that's happening in the record business generally. To some extent it's also the same with FTD - no more so on 5" than on 7" - at least only marginally. In the beginning we couldn't see that PD releases and bootlegs affected the sales of our product, but we certainly can now. There is a LOT of product available to the fans, and obviously almost everybody is struggling to keep up. We sell less than half of what we did a few years ago. On how long FTD will be able to keep releasing live concert soundboards - "A shot from the hip - two to three years? Ask me again then." On the 1969 Memphis sessions outtakes "of course the material will be made available at some point"
On Classic Albums - "We will release all the original albums in the 'Classic Albums' format, if we have something to include that makes it worthwhile." 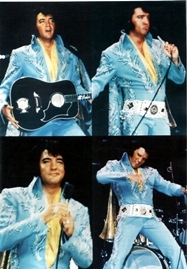 He also notes that "Elvis In Concert" is in FTD's release plan, although not anywhere in the near future. On the Legacy Series - "They sell very well in America - on a completely different level than FTD. The decision on how many more and how much longer is entirely up to the Legacy people. Roger and I just come up with proposals." 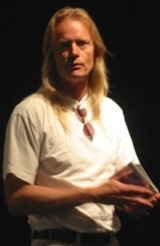 Go here for EIN's collected Ernst Jorgensen & Roger Semon Interviews. 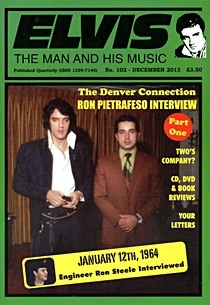 And please purchase this issue of 'Elvis The Man and His Music' for the whole, very interesting interview. 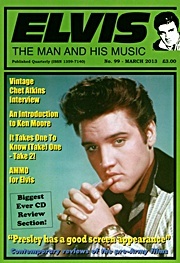 ‘Elvis The Man & His Music’ March 2012: Issue #95 of this very fine magazine is out now - and in EIN's opinion it is one of their BEST ever! - Catching Up With Ernst: Trevor Cajiao interviews Ernst. - Book Reviews: 'What Elvis Never Knew', 'Treat Me Nice: Elvis, His Music And The Frankenstein Creature' and and excellent, detailed review of 'King Creole: Frame By Frame' (see sample pics right). - As Hot As An Erupting Volcano: Ger Rijff casts an eye over the recent book 'A Moment In Time - 4 Days In 56'. 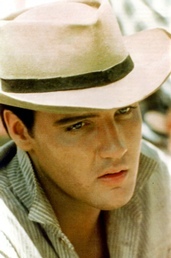 - Spinout Movie Trivia: Facts about Elvis' 22nd film. - Meeting Elvis by Roy Brown. - Casting the First Stone: 'Elvis: What Happened?' 35 Years on: Luther Moore examines the history behind the controversial 'bodyguards' book. In this fascinating and lengthy article, Luther Moore looks at the bad - and the good! - of this often discussed tabloid thrashing of Elvis' legacy. - Plus of course, the magazine includes the usual great CD reviews and Elvis news round-up. DON'T MISS OUT on this great issue - Go here for more info and to purchase. 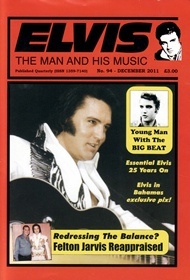 ‘Elvis The Man & His Music’ December 2011: Issue #94 of this very fine magazine is out now, the contents include, some great snaps of Elvis in 1971..
Paradise Bahamas Style - A great article by Tony Stuchbury with Unseen Pix! 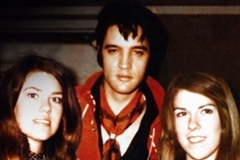 'Felton Jarvis Reappraised' is a truly fascinating article about Elvis' producer. … It's the (overdub) work as much as anything that defines Elvis' '70s sound - brassy Vegas-type horns with twee string sections that Elvis seemed increasingly drawn to, and that Jarvis seemed either unwilling or powerless to deflect. And it's that acquiescence on Jarvis' part that seems to be the bone of major contention today - that had he been a stronger personality, had he stood up to Elvis, things might have turned out differently. "He and Felton worked real good together", said Gordon Stoker of The Jordanaires. - Plus a DVD review of ‘Elvis Live Live Live Vol.2 and the usual great CD reviews and news round-up. Go here for more info and to purchase this issue. Now Dig This has been published monthly since April 1983. 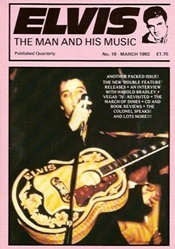 Elvis - The Man & His Music has been published quarterly since December 1988. Both magazines are independently produced and printed in the North East of England. Editor of both publications isTrevor Cajiao. ETM&HM regularly run interviews with all sorts of Elvis associates, such as musicians, songwriters, co-stars, producers and friends. Some of these have included Scotty Moore, Otis Blackwell, Jerry Schilling, Steve Binder, Ronnie Tutt, Dolores Hart, Jerry Scheff, D.J. Fontana, Richard Davis, George Klein, Gordon Stoker, Jack Grinnage, Mort Shuman, Dave Hebler, Red West, Dennis Linde, Wanda Jackson, Bob Moore, Billy Swan, David Briggs, Joe Guercio, Marlyn Mason, Ben Weisman, Bobby Morris, Hugh Jarrett and Reggie Young. 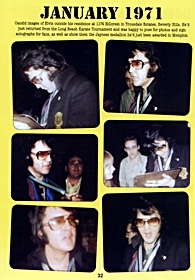 A selection of these interviews were published in the best-selling 1997 book, 'Talking Elvis'.